A burrito is a type of Mexican food. 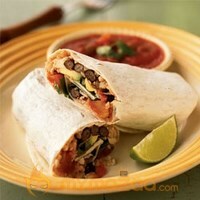 It consists of a wheat flour tortilla wrapped or folded into a cylindrical shape to completely enclose a filling. (In contrast, a taco is generally formed by simply folding a tortilla in half around a filling, leaving the semicircular perimeter open.) The flour tortilla is usually lightly grilled or steamed, to soften it and make it more pliable. In Mexico, meat and refried beans are sometimes the only fillings. 1 Heat torTillas on a griddle plate (tawa) unTil hot, pliable and make sure it does not become dry. 2 Place about 2 tbsps. of Refried Beans and Avocado dip, a little below the center of the torTilla. 3 Top it up with the salsa sauce fresca and fold sides of torTilla over filling to center. 4 Fold bottom over filling and roll up, enclosing filling completely. 5 Serve immediately as burritos tend to become soggy very soon.